Second-Best: Members of Canada’s 1936 Olympic take a pause by the lake-rink at Riessersee. From the left, they are: Pud Kitchen, Dinty Moore, Hugh Farquharson, Ken Farmer, Dave Neville, Arnold Deacon, Bill Thomson, Alex Sinclair, and captain Herman Murray. The world didn’t end that February Friday, a few weeks back, as the Olympics played down and Canada’s men lost their hockey semi-final to upstart Germany, but it shuddered a little. 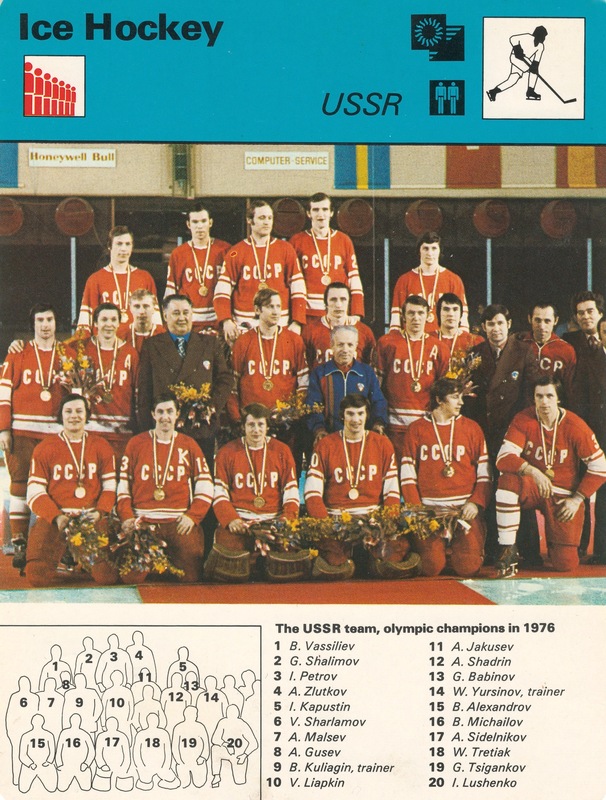 “Eishockey-Sensation” was the early headline from Der Spiegel, and German Twitter trilled will mentions of a “Wunder auf Eis” — a new Miracle on Ice. In Canada, it was morning, and the nation mourned, briefly. And moaned: about Gary Bettman, whose fault it all was, really, denying us our golden birthright; that the guy who scored Germany’s first goal is from Winnipeg; that (as Don Cherry raved) the linesman who called that stupid early penalty is Russian, i.e. linchpin of a vast conspiracy to see us humiliated. By Saturday, when we beat the Czech Republic to win bronze, the national mood was brighter. That’s it? Have we really mellowed so much in the years since the almost-calamity of 1972 that no-one’s calling for a royal commission to look into how we failed to finish? Don’t we care any more? Could be, I guess, a matter of faith, one that’s so strong and enduring that we don’t have to speak it let alone achieve it: what matters is not who actually won so much as what would have happened if Crosby and Connor and Carey had been on the job in South Korea. Whatever the case, we’ve calmed down since our first Olympic hockey undoing, in Germany in 1936 at Garmisch-Partenkirchen. Up to that point, through four Olympic tournaments, Canadians had never lost a game, never come home with a medal that wasn’t golden. 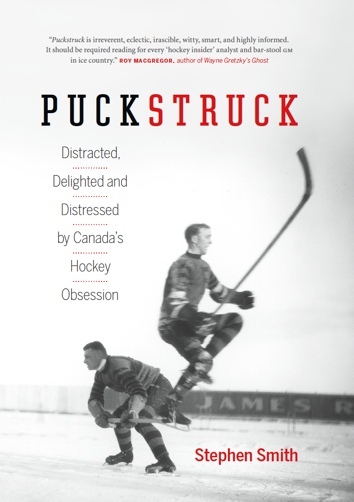 Looking back on what happened 82 years ago is like studying the original operating instructions for Canadian hockey humility, and/or the lack thereof. 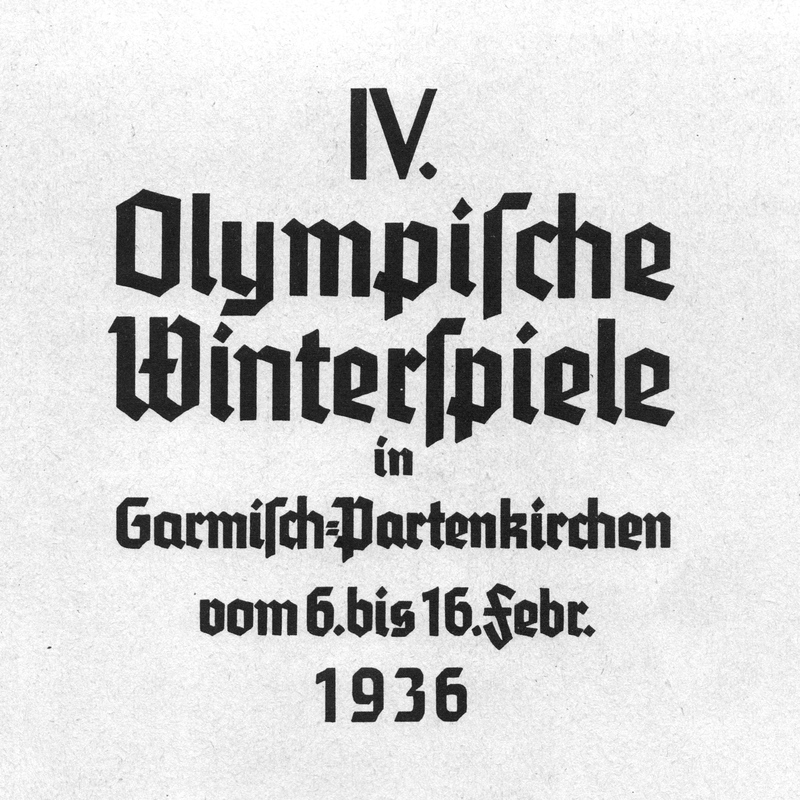 Winter and summer, the 1936 Olympics were, of course, in Germany, presided over by Adolf Hitler and other odious Nazis. That’s a stain that’s only darkened by what we know, now, about what the next ten years would bring. In Garmisch, the hockey tournament started with a kerfuffle over the eligibility of several players on the team from Great Britain who’d played previously in Canada. Their hockey paperwork wasn’t in order, Canadian officials maintained. The British disagreed, and almost withdrew, in a snit, but didn’t. When the hockey got going, Canada beat, and breezily, Poland, Latvia, and Austria, before facing off with the British. They started with a snap, which is to say a speculative slap, from long range, that bamboozled Canadian goaltender Dinty Moore, nesting in the net. The Canadians tied the score, then continued to bombard British goaltender and sort-of Canadian Jimmy Foster. But it was the British who scored again, on a break in the third. The game ended, shockingly, 2-1 not-for-us. Goal of Gold: It took a third-period goal for Great Britain to beat Canada on February 11, 1936. 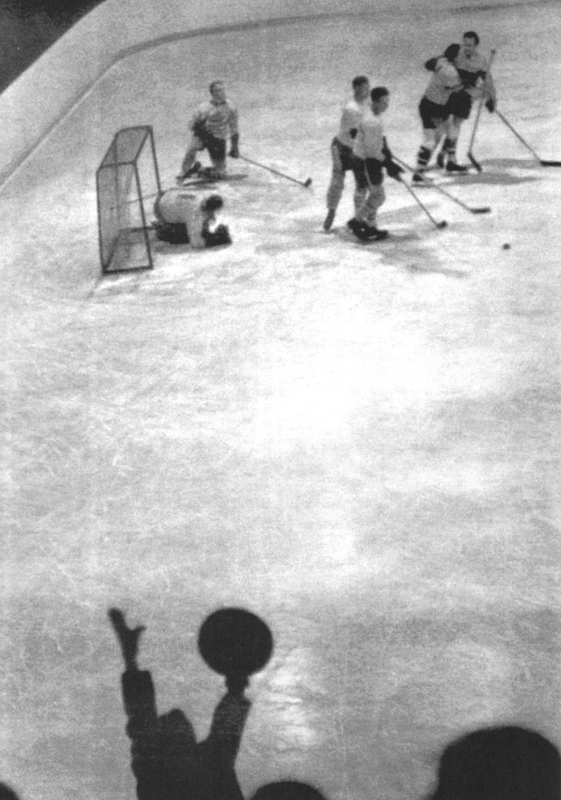 In the moments before this photograph was taken Britain’s Gordon Dailley skated in on Canadian goaltender Dinty Moore, before passing to Chirp Brenchley, who scored. “Canadian hockey hats are off to England this morning,” one Toronto columnist wrote next morning, but her gracious voice was a lonely one. Most of the newspaper accounts echoed the Star’s European correspondent, Matthew Halton, who’d watched the disaster unfold. “We are feeling pretty sick here today,” he advised. As if the news from Germany wasn’t dismal enough that day, a local prophet who ran his own church out of his living room was making front-page news with an unsettling forecast: by Friday, the world would be expiring. This was Bible-based, apparently, nothing to do with hockey. In Germany, oblivious to the reckoning that was three days away, the Canadians played on. Whupping Hungary 15-0 was a tonic, and got us our groove back, briefly. But it was at this point that Canadian team officials discovered that they didn’t really understand how the tournament was set up. Yes, they would advance to the medal round with the British, the Americans, and the Czechoslovaks; no, they wouldn’t get a chance to play the British again. They would have to live with their loss — and the precious points that Britain would carry over. Now it was Canada’s turn to threaten to take its pucks and go home. Instead, we attended an emergency meeting of the Ligue International Hockey sur Glace, arguing that that the final four teams should start afresh, play a whole new round-robin, allowing us to take our revenge and restore order to the universe. This was put to a vote. Canada won its final two games fairly tranquilly, but it didn’t matter, the gold belonged to Britain. For the first time in Olympic hockey history, we were a shameful second. Finger-Pointing ensued. Later, in March, when the hockey players finally returned home to Canada, they were quick to reproach Canadian team management for fumbling their responsibilities. In February, there was some question at home of how it could be that these officials hadn’t known the rules of the very tournament in which they were participating. “It is something hardly creditable to Canadian smartness,” an editorial in The Ottawa Journal sniffed. Lessons learned? I don’t know that there’s any real evidence of that. If you count the extent to which the press emphasized just how many of the British players had learned their hockey in Canada, then, yes, I guess we did kind own the loss. Here was a logic we could live with: Canadians hadn’t failed, they’d just succeeded under someone else’s flag. Doomsday in Toronto was cold and snowy, and altogether free (it turned out) of hellfire. Friday came and went, and then it was Saturday. Frisky reporters staking out Harold Varney’s doorstep demanded to know: if he was so sure of imminent Armageddon, why had he put out his bottles for the milkman the night before? 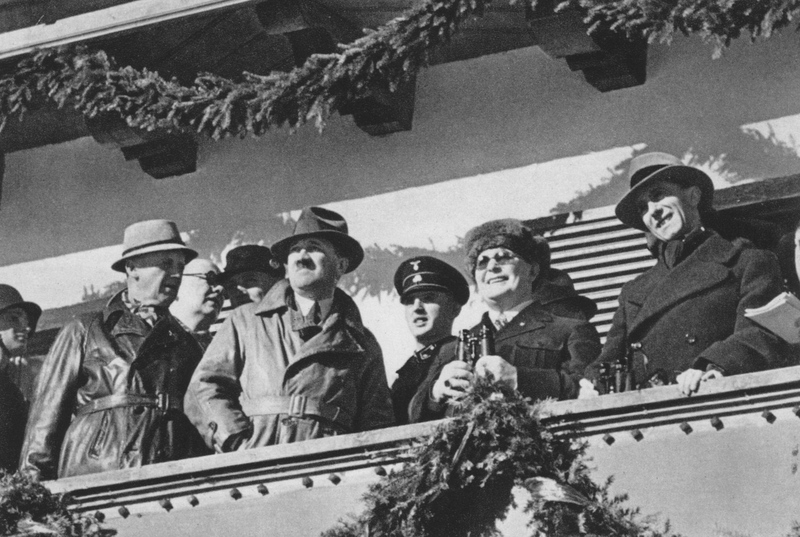 In The Olympic Spirit: Adolf Hitler takes in the Olympics alongside the head of the Luftwaffe, Hermann Göring (centre, with binoculars), and propaganda chief Joseph Goebbels. 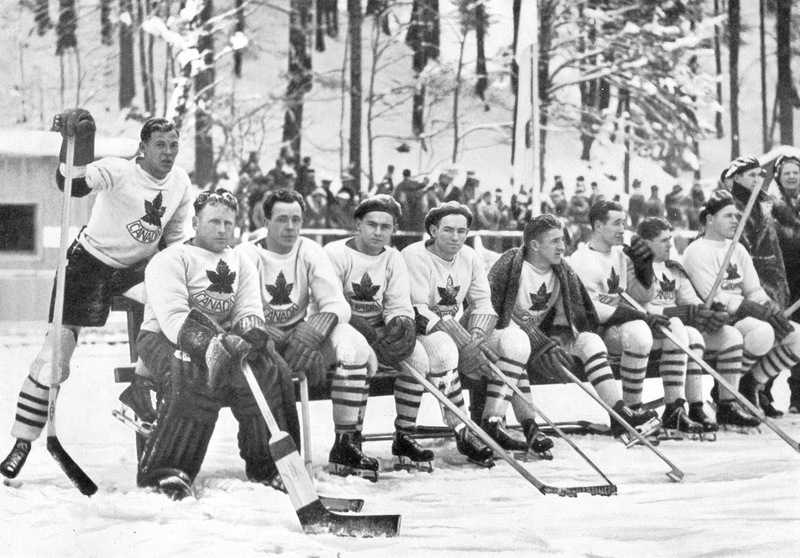 The hockey tournament at the 1936 Winter Olympics wasn’t without controversy. For Canada, it was very much with controversy, and long before the team from (mostly) Port Arthur ever arrived in Germany. 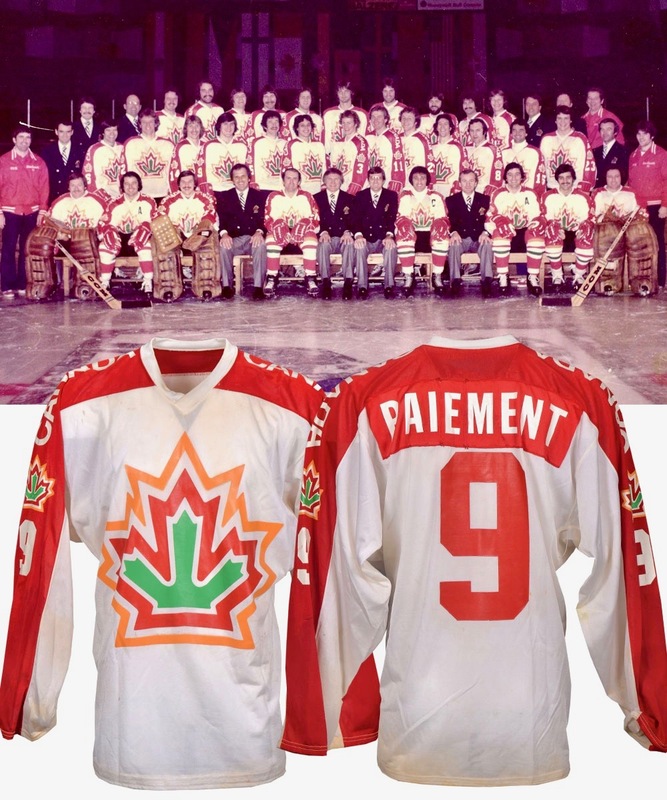 The trouble they got into in Garmisch-Partenkirchen was complicated, but it boiled down to this: on February 11, Canada lost its first ever Olympic hockey game by a score of 2-1 to … Great Britain. Subsequent Canadian thwackings of Hungary (by 15-0) and the hosts from Germany (6-2) weren’t enough to shift the standings in Canada’s favour, which meant that they went home with silver medals, while the Great British won gold, and the right (above) to skate triumphantly towards a photographer on the ice at Lake Riesser. 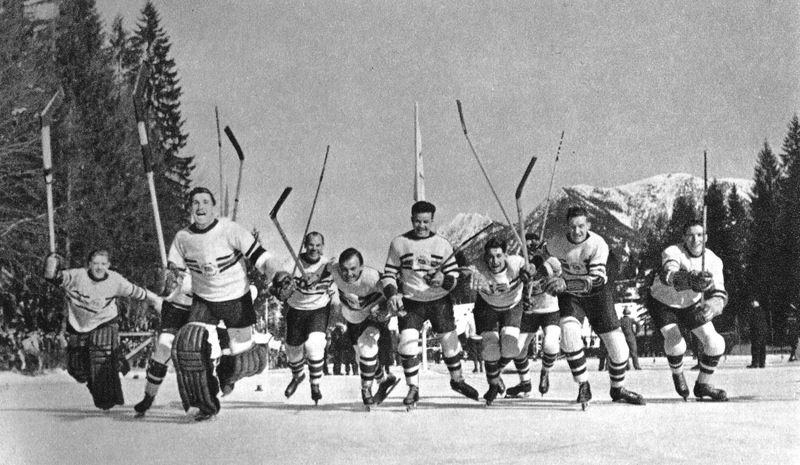 Spit-Take: As Germany prepares to play for Olympic gold in South Korea, a glance back at what passed for hockey humour (and sports enthusiasm) at the 1936 Winter Games, when the Germans were the home team at Garmisch-Partenkirchen, and finished tied for fifth place in a field of 15 teams. Canadians won’t, this morning, find much that’s consoling in the news that a team wearing the maple leaf did beat Germany back in February of 1936, but it’s true, they did it, 6-2 was the score in Garmisch-Partenkirchen at the IV Winter Olympics. Recognized as one of Europe’s best hockey players (and a national tennis champion, to boot), 27-year-old winger Gustav Jaenecke was the German captain at Garmisch. 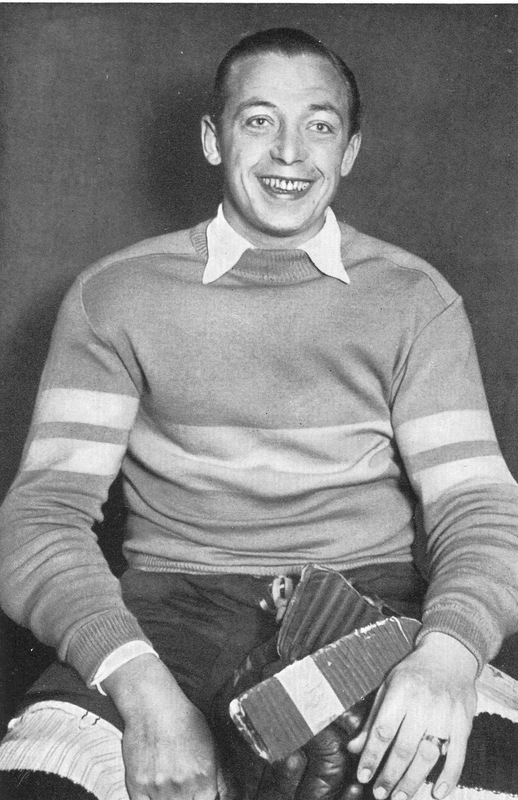 The German coach — Reichstrainer — was Val Hoffinger, a son of Salvador, Saskatchewan who’d played a handful of games for the Chicago Black Hawks. In the six weeks leading up to the Olympics, Hoffinger had his charges testing themselves against a training team, or Lermanschaft, that he’d organized and stocked with eight Canadians. 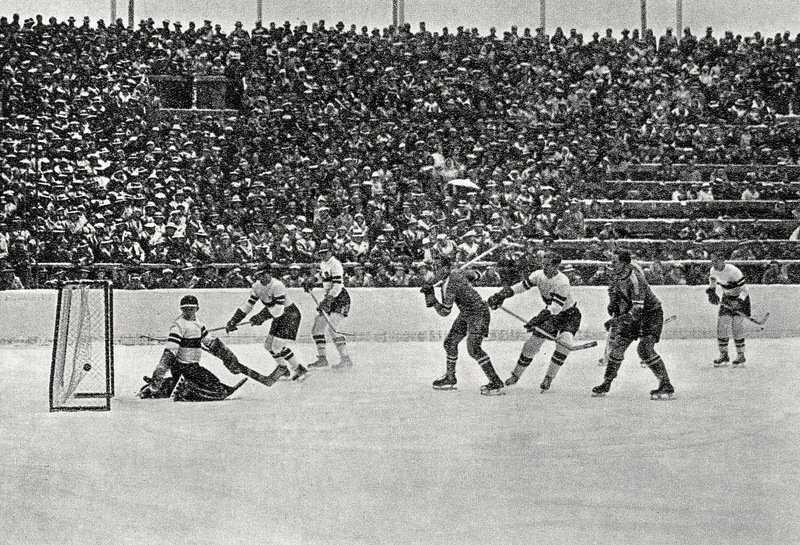 A reporter watching the Germans before the Games noted that they had a tendency on the attack to swerve toward the corners, and they liked to grab their opponents’ sticks, but nonetheless deemed them a “smooth-skating, thoroughly disciplined corps.” At the Games, the Germans followed up an opening-day loss to the United States with wins over Italy and Switzerland. That got them to the second round, where they edged Hungary before achieving something Canada couldn’t. While the Canadians lost to the eventual champions from Great Britain, Germany held the British to a 1-1 tie. 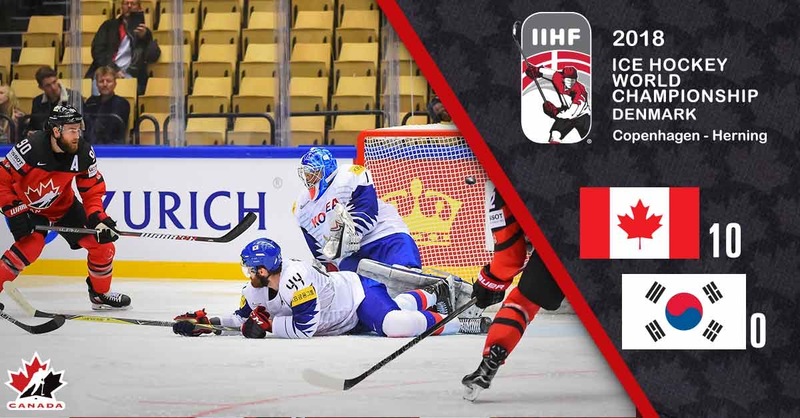 After beating the Germans, Canada finished the tournament with a pair of wins that didn’t end up turning their silver medals to gold. Germany finished the tournament in fifth place, tied with Sweden.